Earlier today, in our announcement of the Rebirth of The Rise of Aredor Series, I promised an interview with the author. Never fear, for my word has been kept (only because Claire is awesome). I had some random questions for Ms. Banschbach, but in the wackiness of my brain there is a rhyme to the reason (or lack thereof). We have a splendid opportunity to know the author behind this world of Aredor, to see how she thinks and connect in a way that would otherwise be unattainable. This is one reason to appreciate the freedom of the internet. So, let’s put Claire in the hot seat and get this interview rolling! Rachael: What sort of character is your favorite to write? Claire: While I do like the snarky, easy going protagonist, I’ve been working on a character who has some anti-hero tendencies, and I’ve really enjoyed writing him. Like it almost kind of worries me how much I enjoy writing him. Haha! Rachael: Oooo, anti-hero type, huh? We’ll have to get together an talk more about this another time. I’m curious! I’m assuming many authors have influenced the kinds of characters you like to write, so who is/are your top favorite author(s) and favorite book(s)? Claire: Brian Jacques, Andre Norton, and K.M. Shea are definitely top authors. Some favorite books would probably be Dare by Tricia Mingerink, and Blood Song by Anthony Ryan. Rachael: Cool! These are all going on my TBR list. (I added links to Goodreads, so all y’alls can add them to yours too!) But while I read some of these authors and their books, I like to snack. Maybe a little too much. If you had to choose between a bagel and cream cheese or a pizza with sardines to snack on, which would you choose? Rachael: Well, I had to ask. My best friend has fond memories of eating sardines. I am on your side, though! Seriously. In fact, I avoid the canned fish meat the the store. Speaking of . . . do you ever talk to yourself in the grocery store? Claire: Umm…yes. All the time. I did last time I was in the grocery store and made myself stop when I realized what I was doing. Rachael: Ha! I’m not the only one! I sometimes sing, too, but I digress. I figure it makes me kind of memorable, though. Not that that’s a good thing in this case . . . ahem. Moving on. What has been your most memorable moment as a writer, good or bad? Rachael: Oh man! Now you definitely have to come back so we can talk about a certain anti-hero character and the secret to writing descriptions! So glad we got to have this talk today, Claire. Thank you for taking the time to come on my blog and share about yourself. I just want to remind everyone about the giveaway that Claire is doing for the amazing relaunch of The Rise of Aredor series! 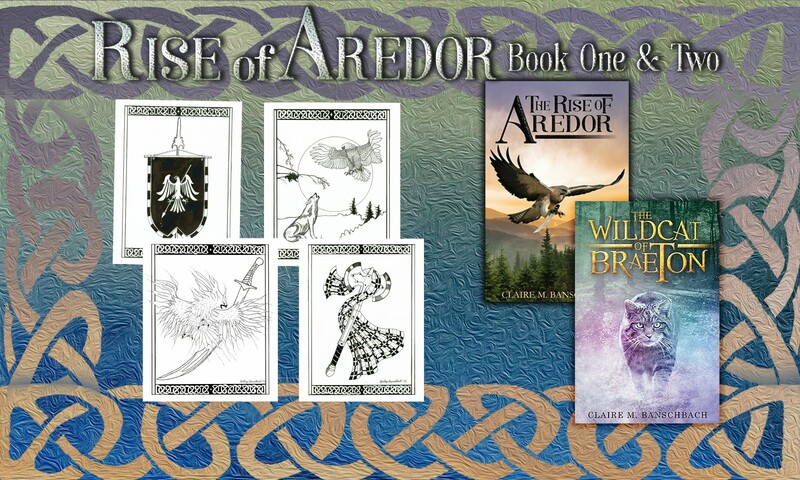 You have the chance to win, ebooks of The Rise of Aredor & The Wildcat of Braeton, a set of four note cards, or the grand prize of a signed paperback set of the books plus a note card of your choice! Click here or on this pic to get in on the drawing! Purchase the series on Amazon! One of the best things you could do today is purchase these books here. And when you read them, be sure to leave reviews on Amazon to support Claire M. Banschbach. Check out this interview with novelist Claire Bansbach as featured on Rachael Ritchey’s blog.